Did you get tired of dealing with unauthorized agents claiming to have Commercial Aircraft and Engines and waste your valuable times? Do you cross check various sources for availability of aircraft/engine or a business to commit your aircraft every month? Would you like to reduce your marketing workload and to concentrate on negotiations with seriously interested parties willing to purchase or lease your aircraft or engines? If your answers are YES to above, we have good news for you. 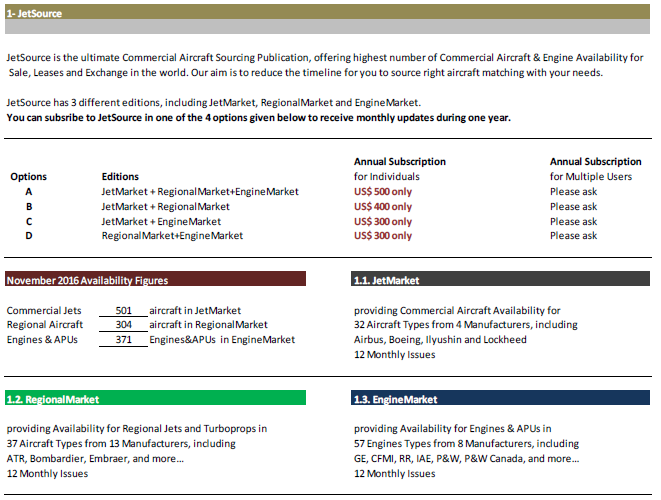 We recently introduced JetSource, comprised of 3 editions; JetMarket, RegionalMarket and EngineMarket. 1- We can market your aircraft and engines in JetSource for Free ! + Your clients do not need to have a print out copy, pdf format can work for them much more better.